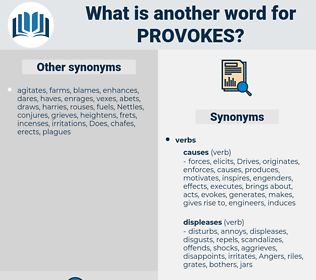 What is another word for provokes? symptoms, leads, results, fuels, fans, elicits. 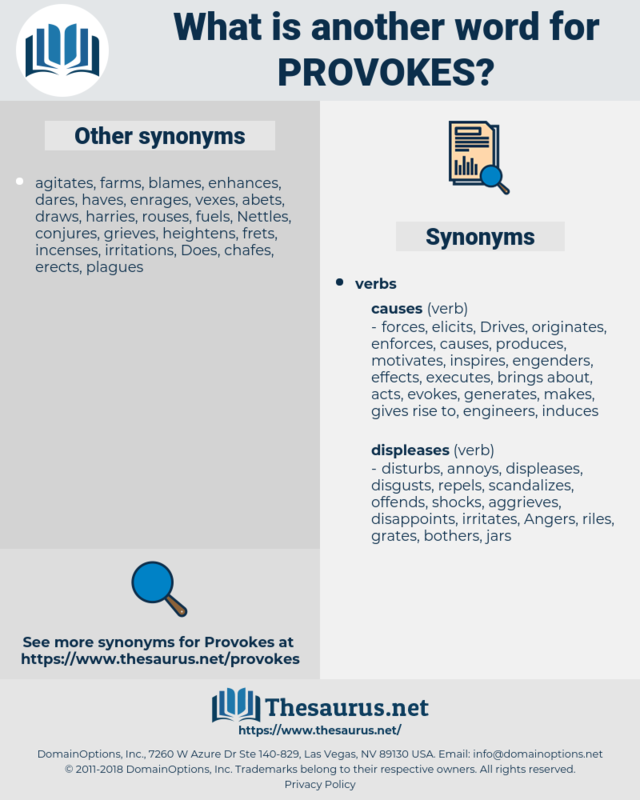 invokes, procures, engenders, encourages, proposes, produces, develops, promotes, generates, motivates, inspires, stimulated, stimulates, presents, explores, stirs, fosters, opens, induces, contributes, delivers, Strikes, attracts, excites, necessitates, initiates, explodes, invites, confers, imposes, incurs, creates, renders, urges, awakens, inflicts, involves, brings, suggests, arises, enjoys, instils, arranges, instills, implies, Leaves, detonates, entail, entails, populates, throws, offers, entrains, spawns, accrues, breeds, establishes, achieves, introduces, begets, engages, spells, emits, yields, builds, Carries, relies, calculates, Gives, commands, Drives, sexual, asks, starts, puts, turns, floats, lifts, sets, assumes, discusses, pits, switches, makes, begs, trains, spins, meets, gets, calls, results, poses, evokes, casts, elicits. The whole thing is executed in a rough and naive manner, with an almost childish minuteness which provokes a smile; we should, however, not despise it, for it is the oldest map in the world. And then she is courted and flattered on all sides; she lives in a smoke of incense: do you think, even supposing that all other difficulties were removed - that she cared for no one else, that she were to care for me, that the influence of her father was gone - do you think she would surrender all the admiration she provokes and the excitement of the life she leads, to come and live in a dungeon in the Highlands?